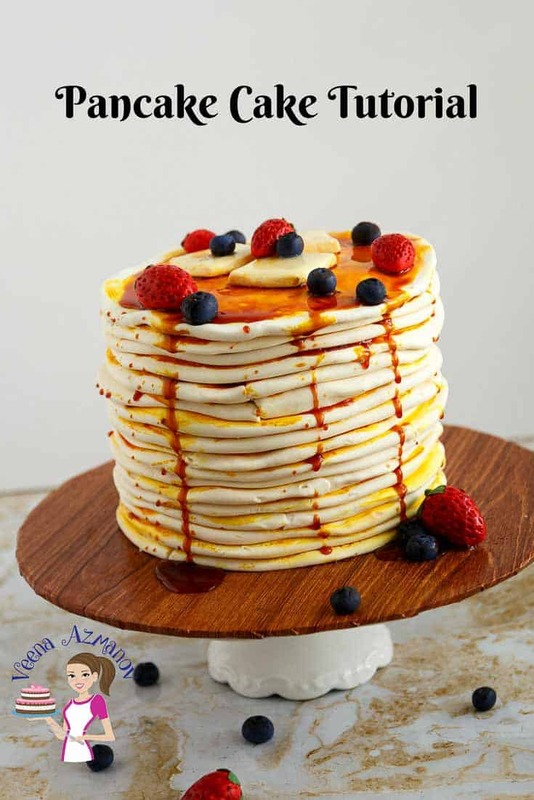 A pancake cake is a fun cake to make for any gender or any age. Weather you are 10 or 60 this is one cake thats bound to bring a smile on your face. 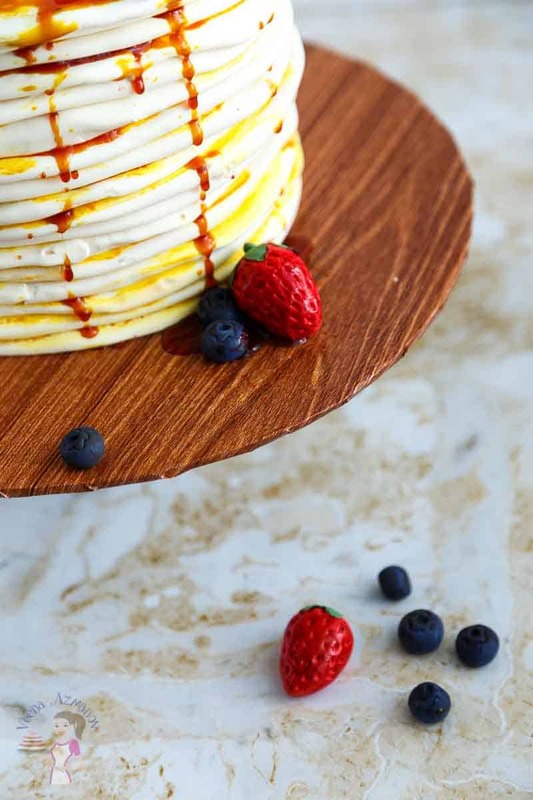 This pancake cake tutorial will show you just how simple, easy and effortless it is to create this cake in no time at all. Use my tips and special notes to help you perfect this fondant food cake. I had so much fun making this cake and it was so well received. Making a pancake cake has always been on my list and I thought well, its about time!! Can you see those strawberries and blueberries? Don’t they look so real? I love how they turned out. No one could believe those blueberries were sugarpaste! Of course I had to share with you how I made this cake, so I left the camera on. A lot of the process is very repetitive and yet quite fun really. So here’s the video for those who do not get You Tube in your country. Below is also the You Tube video so you an choose which works for you. 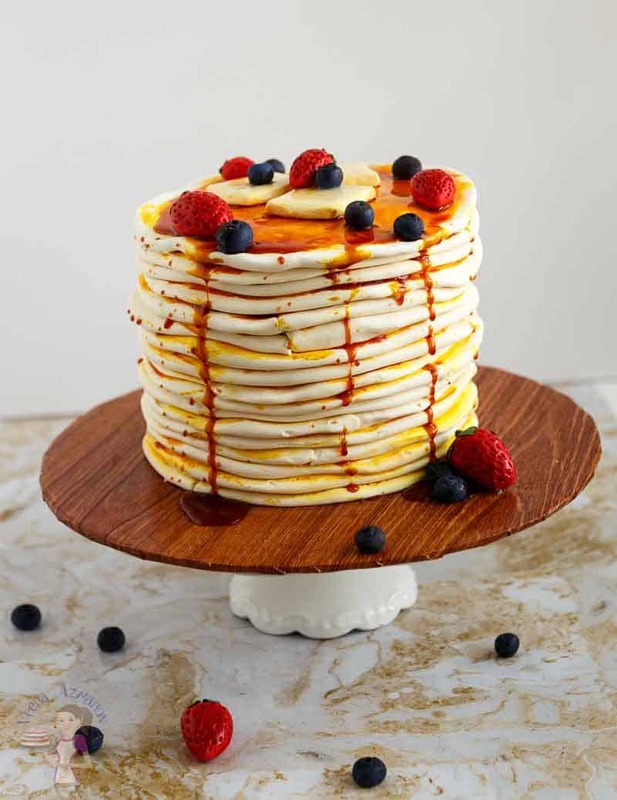 Video – Pancake Cake Tutorial – How to make a Pancake Cake. Cake – I’ve used 4 layers of my Red Velvet Cake. I use the batter for an 8 inch round but baked 4 layers of 6 inch round cake so I would have an almost 8 inch tall cake. Frosting – I have used my Velvet American Buttercream recipe today but Swiss meringue buttercream, Italian meringue buttercream or French buttercream would work just as well. Fondant /Sugar Paste – I used my marshmallow fondant recipe today – about 1 .1 kg in total. Butter – I used a dab of golden yellow. Again use just a dab to make it creamy not yellow. Strawberry – Magic Colorredand a Olive Green. You can use red and add a dab of brown to deepen the color for the strawberries. And you can use green with a dab of black to deepen the green too! Blueberries – Navy blueand black – I started off with navy blue then added a bit of black. I also dusted the blueberries with black petal dust. Syrup – I used corn syrup with a little golden yellow and touch of brown. I’d say 1/4 cup corn syrup with 1 tsp golden yellow and 1/4 tsp brown. Then add more color if necessary. Or add more corn syrup to dilute the color. You can also use piping gel instead of corn syrup to make the syrup. This is a 6 inch round cake but as you can see it looks more like a 7 1/2 to 8 inch round when finished. Personally I think a tall stack looks nicer (not too tall though). If I had to do this cake again I’d add one more inch to my height. Make sure to distribute the joints in the pancakes all around the circumference so all the joints are not in one area. Alternatively, you can have them all in one place and then mask that with a drip. When placing the butter in the microwave – do it in 10 sec burst. I loved how puffy and more natural the butter looks because the heat melted the sugar paste and corn syrup. 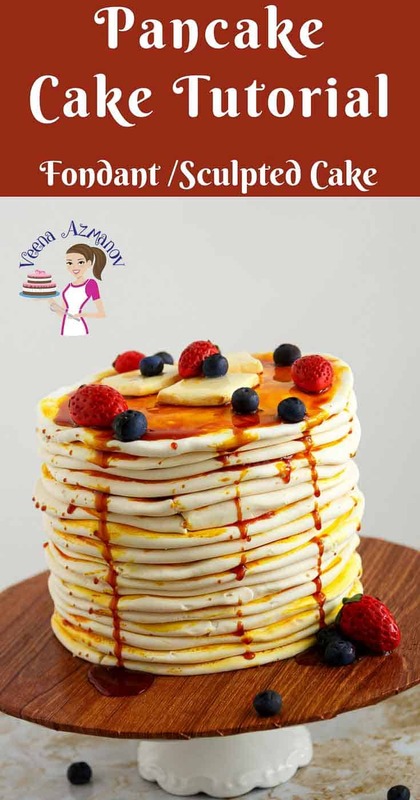 Video on You Tube – How to make a Pancake Cake – Don’t forget to subscribe for more videos every week. Best pancake tutorial ever. Just made one last week. I was dreading it would take forever but with you roll, press and cut in the middle. Such a breeze. I can’t believe how easy it was. Thank you! Love your blog. Thank you, Mattias. So happy you found this tutorial useful. Thanks for coming back to write this feedback. Have a great day. Thank you so much for this tutorial. Have been looking for an easier way to do this. I have a big one to make soon. You are very welcome Elly. Thanks for the Pancake cake tutorial, Veena! I’m planning to make a wedding cake version of this cake for a couple who is having breakfast food at the reception (expecting around 200 guests). I originally thought I would do a typical 3 tiered wedding cake set-up, but decided this might take away from the effect of a uniform pancake stack. I was thinking about stacking 4 12 inch (two layered) cakes on top of each other for a gigantic double barrel cake (using boards and dowels). I’ve never stacked so many uniform layers on top of each other. Do you think it’s advisable? Or do you have alternative advice? Take into account that 2 x 12-inch layers will look really huge. Once you add the fondant edges for the pancake look it will be a 14-inch cake. So that’s a 14-inch double barrel cake. Do you have any layers on top? Honestly, I would go with a traditional three-tier pancake cake. It will be a long time to make the three-layer but the effect will be much better than one large 14-inch double barrel cake. Alternatively, you can make a large double barrel cake with fewer servings – I would not go bigger than a 7 inch if it’s a single layer cake. Aesthetically a small but tall stack of pancakes are more pleasing to the eye. Hope this makes sense. Your cake is fantastic! Thank you so much for sharing!